I have many childhood memories that involve being captivated by stories about sasquatches. One that hit particularly close to home for me (largely because it was said to have happened less than two hours from my house) was that told by a man who initially didn’t want to give his name, but was eventually identified as being one Glenn Thomas. In his classic booklet On the Track of the Sasquatch, author John Green reprints a transcript of a tape recording in which Mr. Thomas talks about what happened to him in the fall of 1967. One cold morning, Mr. Thomas was working with a cat skinner, who apparently did not need him at the moment, so he decided to follow a nearby trail, just to see where it went. As he rounded a bend, he came across a large ridge comprised of good-sized rocks. This was not nearly as remarkable as the three creatures he saw climbing on the boulders. He referred to them as “animals”, but described their appearance as “…human or just about”. Of the three, he identified one as being a large male, another as an adult female, and the third as a small child. He observed the male lifting rocks, turning them over and sniffing them, as if he were searching for something. At one point, the animal apparently found what it was looking for, and started rapidly stacking the rocks, and in so doing dug a large hole. Out of the hole, he produced a ball of grass, which was apparently a nest of hibernating rodents, which the creatures then ate, like a person would eat a banana. Eventually, the creatures became aware of Thomas’ presence, and quickly disappeared into the woods, as sasquatches often do. After giving his interview, Mr. Thomas took author John Green to the site, and a famous photograph was taken of Green’s son, who at the time was five feet, ten inches tall, standing in the hole the sasquatch dug. All that is visible of the youth is his head and the collar of his coat. Several stacks of rocks are also visible in the background. This photograph is a very clear and important part of my childhood pantheon of sasquatch images. This all occurred just outside Estacada, Oregon, and is less than 70 miles by road from my home in Portland. During the summer of 2013, I decided it was time to look for the Glenn Thomas site. It didn’t take long to determine almost exactly where this spot was. Thanks to Google Earth, I was able to discover that there was a very rough doubletrack road that didn’t even merit a number from the forest service that ended abruptly just a couple hundred yards from the first of three “Candidate sites” I was able to pin on the map. After our previous adventures exploring the Bluff Creek area of Northern California, it seemed like a golden opportunity to visit one of the classic era sasquatch encounter sites, and get the whole trip done on a single Saturday. If everything went well, and the hole was still there, we could get pictures of ourselves in it, duplicating another famous image from the history of sasquatchery! Well, it’s kind of complicated, but it actually took two Saturdays. On our first attempt, we actually got within a hundred yards or so of where we were trying to, but in the end, we didn’t get there. It’s okay, though, because that day was quite wet and rainy, as it often is in Oregon, and climbing around on a gigantic pile of wet rocks, in retrospect, was asking very politely for trouble. 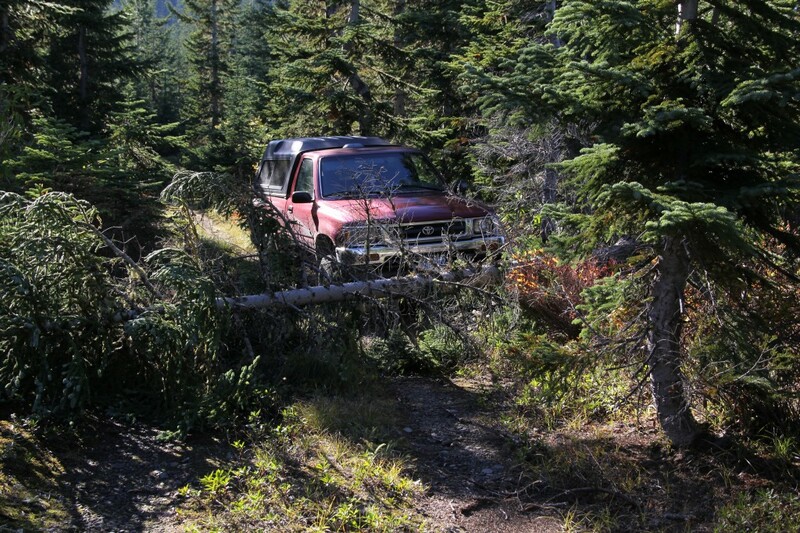 It is becoming something of a tradition with us, that getting to a particular spot in the history of the sasquatch takes us two tries. The second time, we had better weather, a much better map, a better compass, and a much better idea of where we were going and what the environment was going to throw at us. A couple hundred yards before our intended parking spot, this tree had fallen across the road. How many classic sasquatch tales start out this way? Our plan was to drive to a spot I had designated as “The Parking Spot” at the end of the little double-track road, then follow the ridge line to “Candidate site #1”, which was only about 100 yards further into the woods. After following some very faint trails, and avoiding a couple of opportunities to proceed too far down the hillside, we came across Candidate Site #1. We were clearly on the right track! Candidate Site#1 was relatively small, maybe 10-20 yards wide, and only went 20 or so yards up the side of the hill. The view of Mt. Jefferson to the south was beautiful, but it didn’t take long to determine that this was not the location of the hole we were looking for. 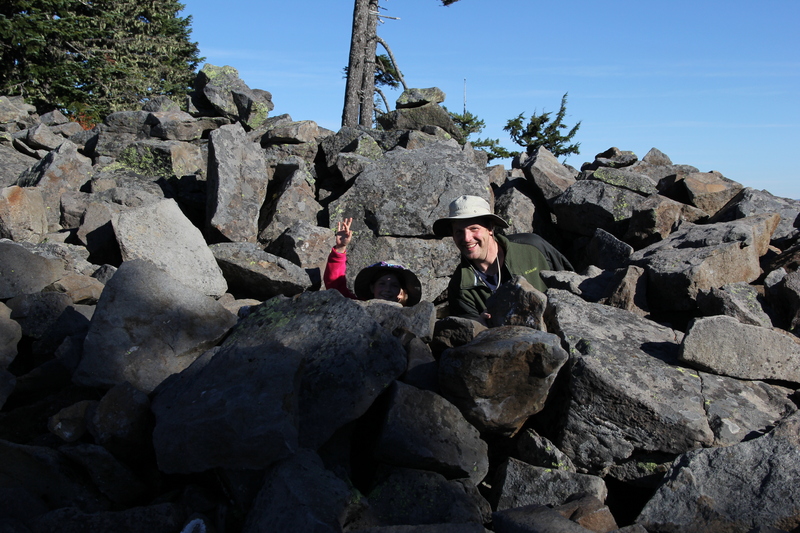 Another short hike, another couple hundred yards north, and a shade east, and we came across another rocky ridge. This ridge had a whole lot going for it. The day was completely clear and bright, and off to the south, Mt Jefferson, in all its majesty, was easily visible. The ridge, which we were referring to as “Candidate Site #2”, was significantly larger in every dimension than candidate site #1. As soon as we walked out of the woods onto the rocks, I got excited. The overall look of the area seemed very familiar, and I started looking around for trees from the background of Green’s photo. I started clambering up the rocks, looking to get to the peak of the ridge and have a look around. Maile called out “Dad, wait!”. I had gotten pretty far up the side of the hill, so I decided to stop, take in the view, snap a few pictures, and wait for Maile. 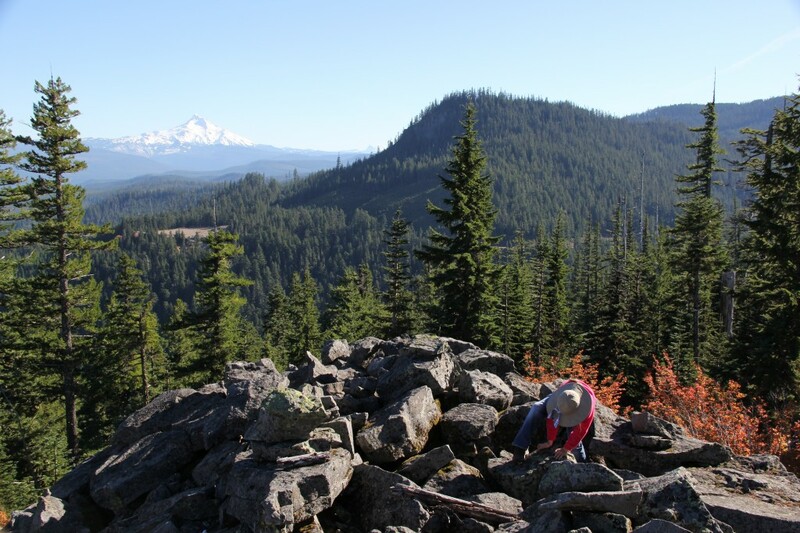 Maile climbing toward the summit of the ridge at the Glenn Thomas site. The clearing in the distance is the upper quarry. Once she caught up, we climbed only a few more feet before I saw it: There was the hole! It was right where Glenn Thomas had described it: Forty feet or so up the west side of the rock pile. I wasn’t sure what to expect as far as how a hole in a pile of rocks would have held up over forty-six years, but amazingly, it appeared that it had, in all that time, remained completely undisturbed. Looking down into the hole a the Glenn Thomas site. The hole sasquatches dug! The hole was about six feet across at the top, narrowing to a dirt floor just big enough for me to place both feet together flat. Standing on the bottom, the rim of the hole on the downhill side was about level with my collar. Maile could completely disappear into it if she’d wanted to. We’d found what we had been looking for, so naturally we had to take some pictures. After all, we live in a time of “Pictures, or it didn’t happen”. Maile and me in the hole! In his interview, Thomas estimated the size and weight of the rocks in the area as weighing “50, 60, or even possible 100 pounds”. I would estimate they are quite a bit heavier than that. That’s when I was struck by the reality of what I was seeing. We’ve been to some pretty famous encounter sites, and some not-so famous ones, but each location was first and foremost completely natural and generally ordinary. Everywhere we’ve gone, it’s been easy to imagine how the encounter may have had a much more mundane explanation. For example, at the Patterson-Gimlin film site at Bluff Creek, there is nothing about the area that precludes the possibility that the film was hoaxed. The same is true of the area around the McKenzie river, and every other “squatchy” place we’ve ever been. This site, though, this hole, was really quite different, and quite strange. There was definitely a hole here, and there were definitely large stacks of big heavy rocks. 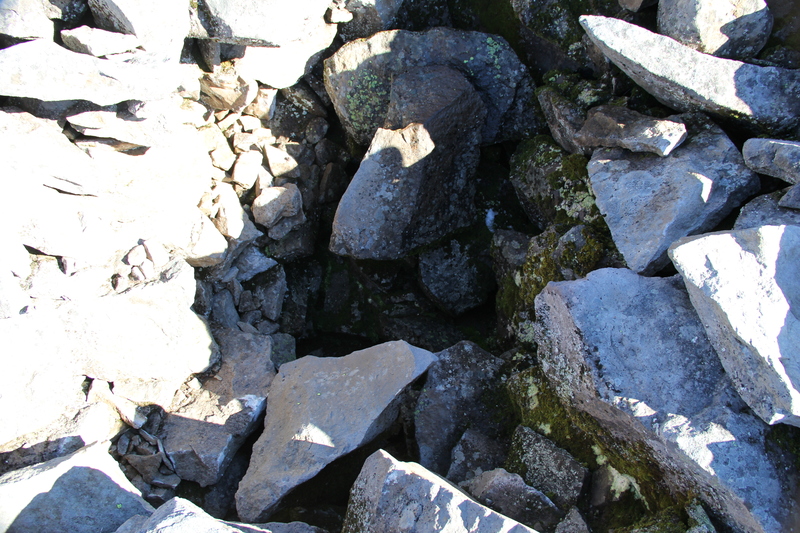 It is also quite clear to me that this hole was dug into the rock pile. I can’t imagine how or why any sort of heavy equipment could have gotten forty feet up the side of a rather steep rocky ridge in order to dig a hole six feet across and nearly as deep. I truly can’t think of how this hole might have come to be, other than by one or more pairs of hands. Given the size and heft of the rocks, the hands would have had to belong to a very strong individual indeed. The idea that Glenn Thomas, and maybe some of his friends, decided to dig the hole as part of a hoax also seems a little strange. It sure seems like a lot of work in a very out-of-the-way location to back up a made-up yarn, when lots of other stories have been taken seriously and become famous with little or no physical evidence. As I was pondering this, I realized that if we wanted to be off the mountain before dark, we’d better start to make our way home. We started our clamber back toward the truck. As I was approaching the bottom of the rocks, I heard something squeak. I turned around to see a small rodent disappear into a crack between two rocks. I laughed out loud and called out to Maile. I wondered how long this particular rodent’s family had lived in these rocks. Perhaps it was a relative of the rodents Thomas claims to have seen the sasquatches eat. The walk back to the truck was short and uneventful. As we drove down the mountain, I felt an exhilarating sense of accomplishment. Glenn Thomas’ story is certainly famous among sasquatch enthusiasts, but the site is not nearly as exciting as, say, the PG film site. There were no signs on the way warning of bigfoot mating activity, nor was there any evidence that any squatchers had made this pilgrimage. The fact that the hole and the rock stacks were still there also suggested that not too many people had been there over the last near half-century for any reason. The fact that the site is so close to our home means that Maile and I will almost certainly be back next season. Once again, we’d had a fantastic adventure!